As an artist, I am extremely grateful that there is room in this world for all forms and levels of art, music, dance, theater and performance art. One has to be grateful that a venue like Highways Performance Space exists as a platform for choreographers, composers and directors to experiment, show their work and perhaps even succeed. With the many that succeed, there are also those who do not; but it can be an avenue to learn from and, hopefully, grow. Triple [Inter]sect included works by three choreographers; Tanya Kane-Parry, Gayle Fekete and Jennifer Gerry, who represent Opera del Espacio, Gayle Fekete and Mechanism Dance Theatre. The three choreographers shared performers and even collaborated with each other as in a work titled doubleTake (in progress – a performative score) by Fekete and Gerry. Indeed, some of the strongest moments came during the transitions between each piece when it was clear that everyone involved had to work together, focus on the tasks at hand to make a smooth transition from one piece to the next. Private n Public by Tanya Kane-Parry in collaboration with Opera de Espacio performers Murri Brown, Gayle Fekete, Sophie Goldstein, Melanie Keller and Kristine A. Robinson took place, for the most part, in the courtyard in front of Highways. We were then directed back inside to the venue’s lobby by Kane-Parry and other members of the ensemble who were not performing in this work, and the piece concluded with the audience following the performers into the theater space. Dressed in red and black Spanish-style dresses, the all-women cast repeated gestures and sounds while having to literally move in and out of the audience who, at times, seemed spatially unaware. The feeling of angst was obvious. The sense of dread was palatable in the air and it was clear that the choreographer was trying to evoke strong emotions. What wasn’t clear, however, was the main focus of this piece. It was driven by the dramatic Bartók Quartet #3/Night Prayers Remix performed by the Kronos Quartet, but did not quite rise to the challenge of that score. As the performers moved around the courtyard, pointing, scratching as if they had lice, falling to the ground and getting in the faces of the audience, I thought of women’s struggles, climate change and even entrapment as when the performers struggled desperately to get out of their beautiful, tight-fitting but constraining dresses. Snapshots by Jennifer Gerry in collaboration with the dancers Jennifer Gerry, Gabriela, and Brenda Reyes-Chavez included many of photo frames scattered over the space, some with pictures and some without. There was a wooden box and a table turned onto its side that no one ever touched or came near. Maybe it was used to continue the rectangular shapes of the frames, or perhaps it was just there as decoration. It’s proximity on the stage, however, made me want someone to include it in the performance. It was unclear to me where this work was going until Gerry’s character began to weep softly and rummage through a box of photographs. She looked at them and then carefully spread them out onto the floor as if remembered those moments that cannot be recaptured, relived or reworked to a more favorable outcome. Gayle Fekete is a compelling performer. She is Head of Dance/Professor in the Department of Theatre and New Dance at Cal Poly Pomona and for 20 years has been associated with Urban Bush Women NYC. Her work doubleTAKE (in progress – a performative score) had really great moments because of Fekete’s ability as a performer. She demands that you pay attention to what she is doing. Past that, however, this piece needed to be edited together to help the audience grasp what she was trying to tell us. There was dialogue by the two performers, Fekete and Gerry, that brought out the performative aspect; but why? Were we supposed to have a double take response to the two performers not communicating well with their double talk? doubleTAKE incorporated two medium sized Plexiglas boxes with translucent plastic sheets balled up inside for the performers to move around, sit on and to stand on top of while they conversed and gestured. These “installation containers” were by JonMarc Edwards. The music included songs by Bad Brains and Chris Herbert. A portable work light was used to illuminate different areas of the space, but it blinded the audience members who were seated directly in its path. The plastic sheets were removed, hidden under by the performers and then used in a very interesting way to transition into the next piece. If, as the title suggests, this work is in progress, I hope that Fekete will take the wonderful seeds that she holds in her mind, nurture them and make them grow. Right now they are, as all seeds are, exciting potential. Roller-Roller (girl of my dreams) by Gayle Fekete was almost a comedy. There were humorous moments and wonderful ingredients to a work with. Roller-Roller took us into an all-women’s bar to watch five women became inebriated and sometimes destructive. The set/props included a table, a pool cue stick, a billiard rack and two decks of cards. A woman on roller skated moved precariously around the space wearing a Minnie Mouse hat. One woman was dressed in pseudo-cowgirl attire and two others in server’s uniforms. Roller-Roller (girl of my dreams) suffered not because of the theme behind it, but from the fact that it looked under-rehearsed. The handling of props needs to be better rehearsed and the skater needs to learn how to skate in the space provided. The strongest characters were the two dressed as servers. They had obviously worked hard to develop their characters. The final piece Shredded, by Kane-Parry to an original composition by Ross Levinson, began very strongly. It showed potential with its set of shredded paper stuffed into bags and scattered over the floor by Fekete during the transition between pieces. 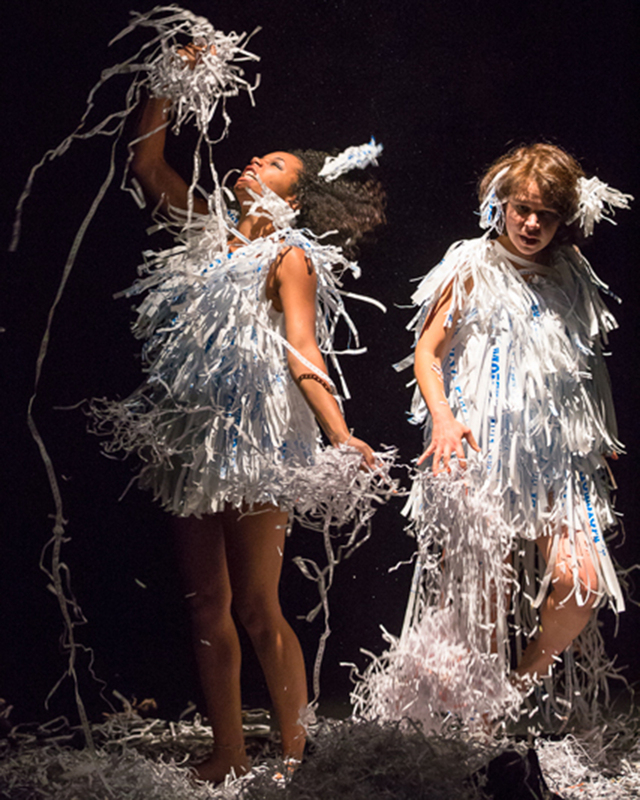 Murri Brown, Sophie Goldstein, Melanie Keller and Kristine A. Robinson dressed in shredded paper dresses, seemed to be suspended in space; hanging from their wrists. The women would return periodically to this position after bursting out into fits of schizophrenic movements; their characters sometime babbling incoherently and scratching at their bodies as if they felt bugs moving underneath their skin. The performer, whose name I unfortunately did not get, performed her mad-woman solo brilliantly. I also enjoyed the section where the four were tossing shredded paper into the air and into their mouths. All five works presented on this concert suffered from the same lack of focus. Each seemed not so much choreographed as they appeared directed, and a few of the performers were not consistently involved in the work. As stated earlier, the transitions were successful because they were well choreographed and rehearsed. There is hope for these groups if each choreographer takes a good look at the moments in their work that hits its mark and then connects those ideas into a clear choreographic statement.